I have a new obsession with making all things meringue. It started with my first try at making macarons. Then it was a giant chocolate pavlova. A few weeks later I thought I would take the idea of a giant pavlova and turn it into personal meringues. I wanted it to be different than your usual pavlova though, which consists of whip cream and fruit. So instead of the cream I used lemon curd. I was worried it would be a little dry without the whipping cream but I was wrong and it turned out great! I made my own homemade lemon curd because it isn't actually that difficult to do! I have bought it in the past because I was too afraid to try making it myself but I won't be doing that again! I topped the meringues off with some local raspberries to really finish it off and it they were great. I brought them to one of our last dinners in Ucluelet with friends and Dave's parents and everyone enjoyed them, even as leftovers the next day. Since I have moved to Victoria and haven't had the chance to unpack yet, my baking has been on the back burner. I have some great recipes planned for the fall though and my list keeps expanding. I made a smoothie bowl the other week that I will definitely share because it was so easy, healthy and delicious, a little change from all the sweets I've been sharing. It's also been very hot so I haven't been wanting to bake as much as usual. This weekend we are heading to a bbq with all the Irish in Victoria and I promised a friend of mine I would make my 'famous' blondies. Next weekend we are headed to Vancouver to see Joe Rogan and visit Dave's brother's family and I'm going to make a birthday surprise for my sister-in-law. I will definitely be including it on the blog, so stay tuned! For now though, try making these delicious meringues, which were super easy to make! Sprinkled with a bit of icing sugar & they're ready to devour! Preheat oven to 200 degrees. Line two baking sheets with parchment paper. In your stand up mixer beat egg whites and salt. When the egg whites are foamy, slowly add in your sugar. Beat for 2-3 minutes until your meringue forms satiny peaks. Add the vinegar and vanilla and beat one more time until all combined. On the baking sheet spoon out mixture to form circles. Use the back of your spoon to create a sort of cavity in the centre of your meringue. I got 12 meringues but depending on how large or small you go, you may get more or less. Bake for 2 hours or until meringues are dry and crisp. 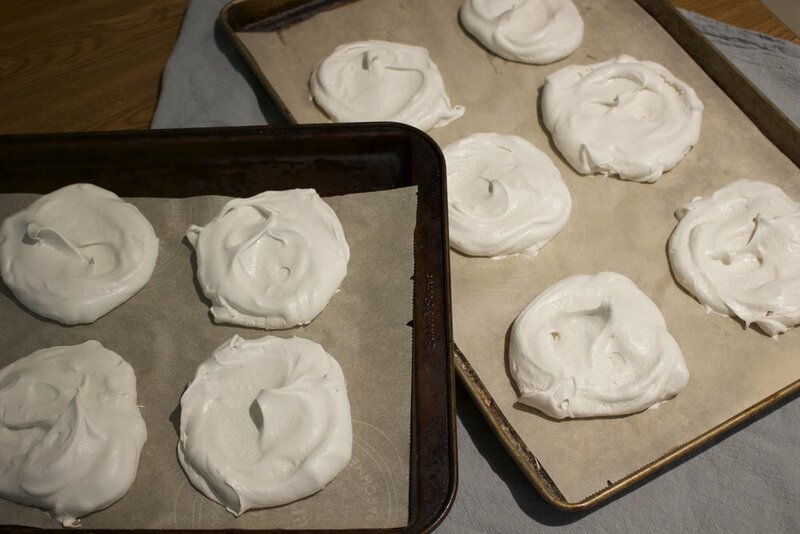 Turn off heat and allow meringues to come to room temperature in the oven with door slightly opened. In a small saucepan over medium heat whisk together egg yolks, sugar and lemon juice until blended. Chop up butter into cubes and add to saucepan with lemon zest. Continue whisking until mixture becomes thick and can coat the back of a spoon, about 10 minutes. Transfer to a small bowl and let cool before placing in fridge. Remove lemon curd from fridge. If it is too thick you can warm it up for a bit to soften. 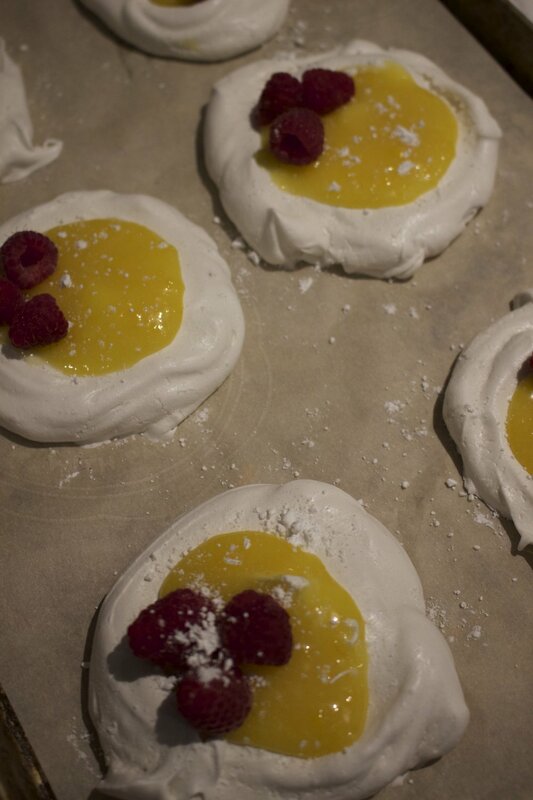 Top meringues with a dollop or two of lemon curd. Add raspberries to the top. If you want to try a mix of summer berries that works too! Or switch out lemon curd for whipping cream if you prefer. Perfect treat for a summer evening!